Accommodations | Communitere: Response. Relief. Renewal. 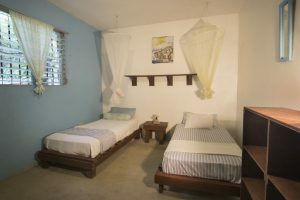 Haiti Communitere’s guesthouse welcomes volunteers, workers, tourists, students, groups and all kinds of travelers to stay in our co-living, co-working space. 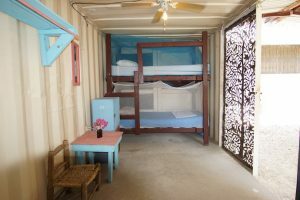 Our rooms are primarily made of alternative building methods like converted shipping containers and adobe. Located within walking distance from the airport, the Haiti Communitere guesthouse offers a unique opportunity to experience Port-au-Prince. Step out of the streets and into our garden, meet our local partners, spend your time exploring the city or simply grab a Prestige and lie back in a hammock. 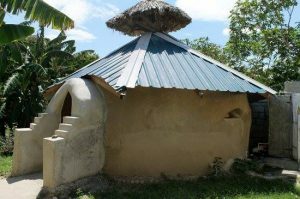 We offer great value, a wonderful place to meet people and all fees from the Haiti Communitere guesthouse go to fund our community projects. We hope to see you! A quick connection to the airport. We can get you there in under 20 minutes! 24 hr wifi, 24 hr reliable electricity and water. A safe neighborhood to explore. A basic breakfast and you can also order a wonderful Haitian dinner! We are currently having some difficulties with our booking links! Please email us at [email protected] to make a reservation. We will respond quickly! 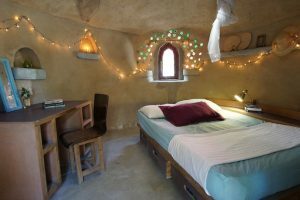 The Earthship is made of earth filled tires, recycled plastic bottles and polyester boxes. It has a double bed, desk, under-bed storage, fairy lights, mosquito net and fan. The Earthship comes with a private toilet. A large passive cooling heat escape in the top of this structure, accompanied with 3 foot thick walls keeps this hobbit-like home at a nice temperature. The Earthship living space was built at Haiti Communitere in response to the 2010 earthquake. Its a demonstration for how homes can be built from waste like tires, plastic bottles, and rubble from the earthquake. The base of the Earthship is made with tires stacked seven high within the walls. 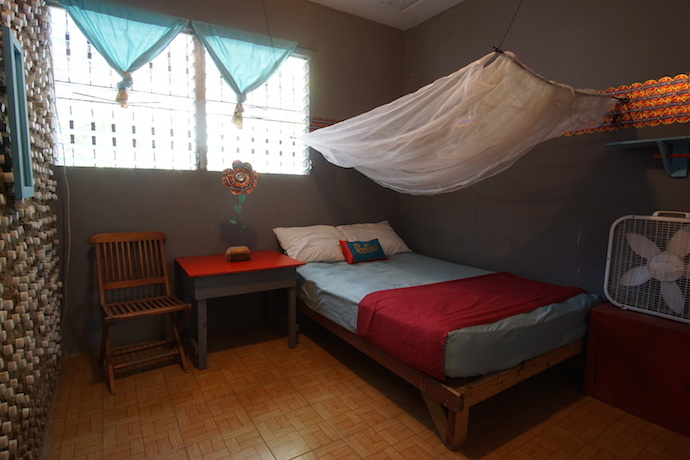 The Super Adobe has a double bed, desk, fan and mosquito net. The earth bag construction uses long fabric bats or tubes filled with adobe, a mixture of 90% earth and 10% cement. The bags and tubes are layered together with barbed wire which acts as a mortar. Structural design mixes modern engineering with ancient earth architecture. This structure resists earthquakes, hurricanes and floods. Book the Super Adobe House! The Silver room is a converted shipping container. It offers privacy and is tucked away from the busy atmosphere at Haiti Communitere. 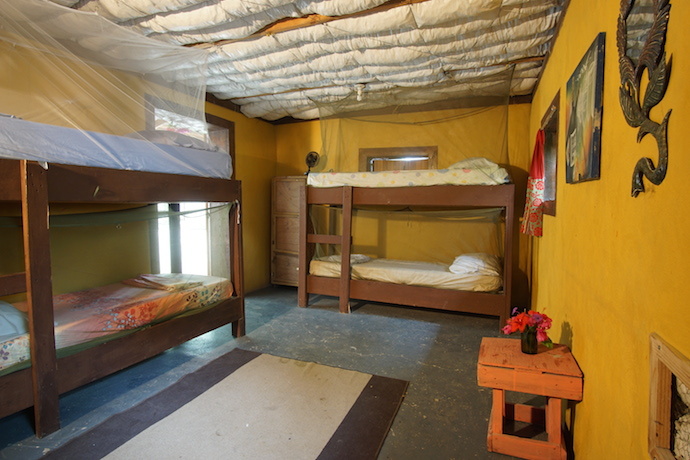 It has air conditioning, a double bed, mosquito net, fan, desk and under the bed storage. Book Silver Room Converted Shipping Container! 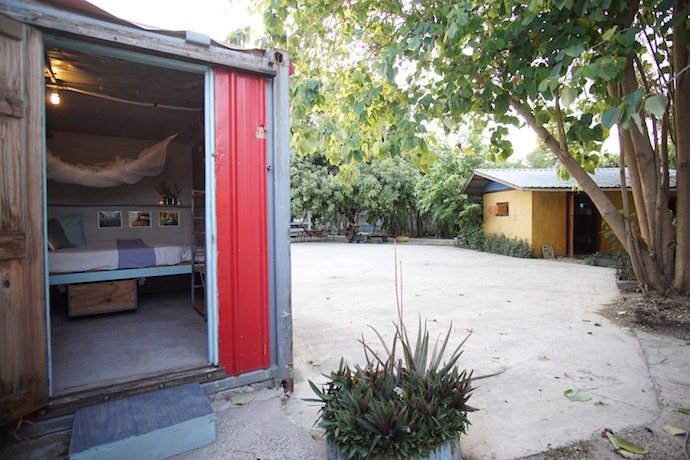 This converted shipping container contains two single beds, under the bed storage, fan and mosquito nets. It is painted a nice purple color and is located away from the main house for those who would like a little more privacy. This room has a double bed, mosquito net and fan and is located in the main house. 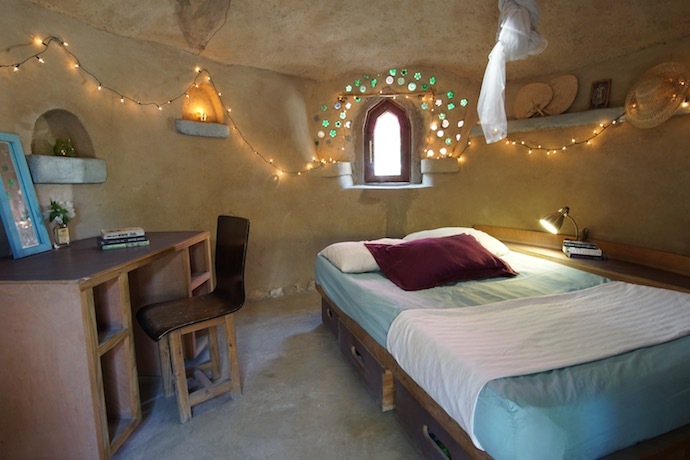 This room has a unique, cob plaster wall, using plastic water bottles stacked between an earthen mortar and earthen plaster. The room is named for Haiti’s national beer company! The Dragonfly is a large, airy room located inside the main house. It contains two single beds, mosquito nets and fans. 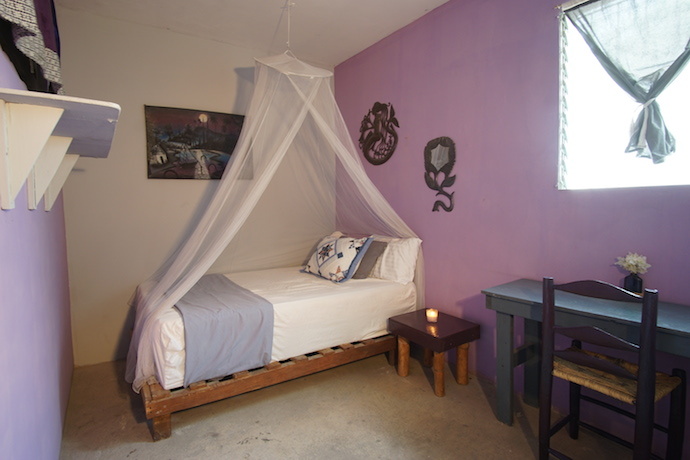 The Butterfly room is a beautiful mauve color with a double bed, mosquito net and fan. The added bonus of having a large wardrobe makes this a great option for long-term stays. It is located inside the main house. Green Room: The Green Room is a budget option for those who would like to combine privacy with stretching their dollars. 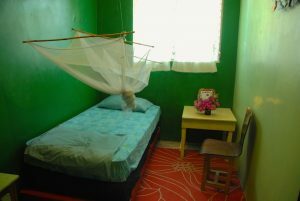 The room is located inside the main house and contains a single bed, mosquito net and fan. 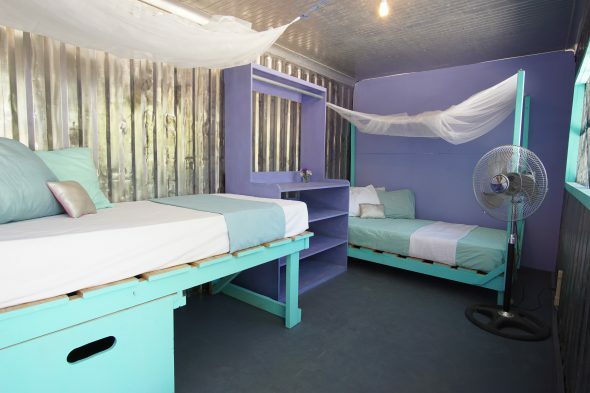 The Give Love & Give More Love converted shipping containers have a total of eight bunk beds. They’re a great option for four to eight people. Their open design keeps them cool, while a picnic table between the two containers offers great hangout or meeting space. Large sections of the shipping container wall were cut out and replaced with artful metal windows for increased ventilation. Book a Bed in the Give Love Shipping Containers! The Ubuntu House is a six-bed dormitory with fans and mosquito nets and lockers. The house is constructed from “ubuntu blocks” made out of polystyrene trash. Ubuntu block houses can use about one 40-foot shipping container’s worth of styrofoam. The styrofoam is collected, crushed and bleached before it is put into rice sacks to make the blocks. The final structure is light-weight and flexible making it highly resistant to earthquakes and less dangerous if it does collapse. Haiti Communitere’s is very well-insulated and is cool and fresh throughout the day while retaining warmth at night. It is a cozy option for groups or individuals. Book a bed in Ubuntu! 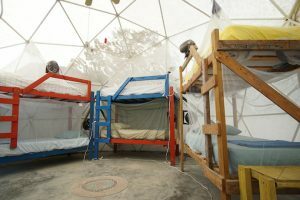 The Geodome is our budget option and contains a total of eight bunk beds and individual lockers, mosquito nets and fans. 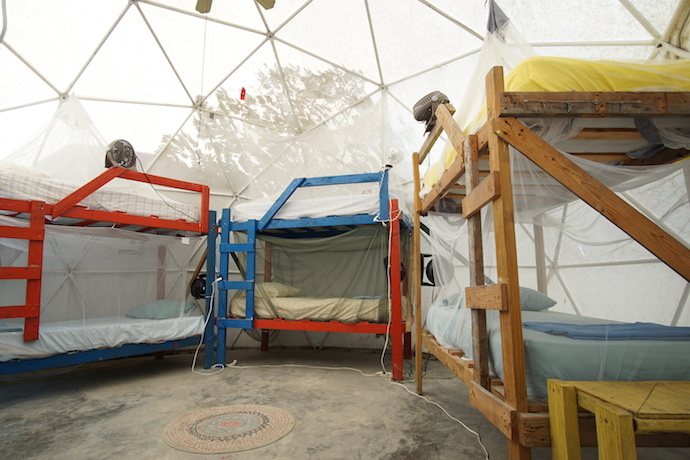 Geodomes are an interesting alternative in disaster situations because they offer the most amount of livable with the least amount of packsize. With minimal materials required, 100 domes (9.1 meter/ 30-foot diameter) can fit into a single shipping container. Book a bed in the Geodome!